In spite of all the excitement we get each year when Christmas comes around, we wonder if there is something that we can do a bit differently to make it a bit more fun and interesting. If you’ve taken a look at your tree and thought about redesigning the whole thing, perhaps you should consider alternative Christmas tree ideas. Alternative trees are a great way to freshen up your Christmas look without going over the top and redesigning the whole home. If you aren’t quite ready to replace your entire tree for the season, don’t worry, there are options for you too. To get this look on the cheap, try searching for some old sticks around your backyard (if you live in a woodsy type of area). It’s okay if they look different from one another, it adds character! If you absolutely must have a cohesive look though, consider spray painting them. This DIY project adds a whole new level of freshness to your home. I would totally add some scented ornaments to this one. Either buy a pre-made cut out, or get the family to work to trace a tree up to create this stunning piece. I love how clean it looks! Have you ever noticed that ladders look a whole lot likes trees? It’s pretty convenient. Just wrap up that ladder and watch it glow. Now this is such a cute budget way to get a place for those presents. Grab yourself a cute garland, give it some lights, and make a tree shape against the wall. If you don’t mind a bit of glitz and glam to your Christmas, try using some metallic. Now this is art. The best part is, you can make a village using the dollar store! Just grab some cute houses and get a bit creative in assembling them together. Have a minimalist decor and don’t want to ruin the theme with a gaudy tree? Keep it simple with some greenery and minimal ornaments. Stack some books together to make a nice and nerdy tree. Just be careful if you have pets or kids though. Remember how I said earlier that I’ve got your back if you don’t want a whole big tree? Try a little tree in a cup. Adorable! Now this is super cute! Build yourself a tree by combining a frame with some hanging ornaments to create the correct shape. Christmas is a time for family, friends, and memories. Remind yourself this year why you guys got together in the first place by placing photos of you favorite past times. Christmas can seem like a very traditional holiday, but it doesn’t mean that it can’t be great if you break a few rules. 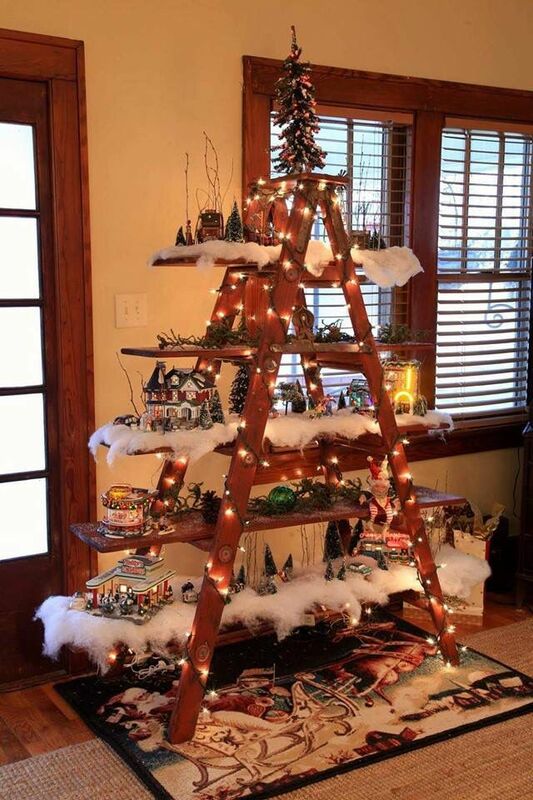 Mix things up this year by trying out some alternative Christmas tree ideas. Heck, it may end up saving you a ton of money! What’s your favorite alternative tree? Let us all know in the comments!